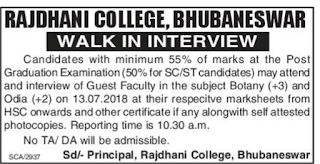 Rajdhani College, Bhubaneswar has advertised in the Sambad newspaper for recruitment of Teaching Faculty- Guest Faculty jobs vacancies. Interested and eligible job aspirants are requested to attend interview on 13.07.2018.Check out further more details below. Name of the College :Rajdhani College, Bhubaneswar. About College: Rajdhani College, .Bhubaneswar, an affiliated college of Utkal University, Odisha started functioning as the Morning Shift of the B.J,B College, Bhubaneswar in the year 1973 offering Intermediate and Degree Courses in the Arts Stream only. Within a short span of two years, it was able to come out of the shadow of the more pronounced elder institution. The College was shifted temporarily to a Government building located in Unit-1 in Bhubaneswar where it continued to function as an independent institution for fourteen long years from 1975 to 1989. Considering the steady expansion in the size of the student community and the number of Programmes offered , the College was shifted to a new campus at Baramunda in 1989 with more than 15 acres of land of its own . Since 1989 till date, the College has struggled constantly to move ahead and make its presence visible. As a result, the obscure institution of the yore is now poised to take a big leap forward, thanks to its expert faculty, vibrant academic environment and an aspiring but disciplined student community. Guest Lecturer- Candidates with minimum 55% of marks at PG level (50% of SC/ST Candidates) will be preferred. May attend the interview on 13.07.2018, at their respective marks sheet from HSC onwards and other certificate if any along with self attested photocopies . 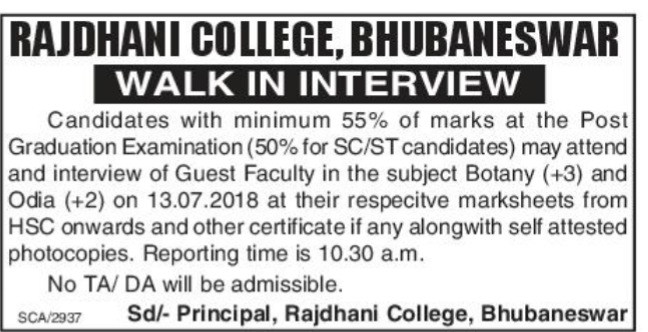 Reference: Recruitment Notification / Career Job Opportunities notice for Teaching Faculty - Guest Lecturer on Sambad newspaper Dated 6th July 2018.